After last fall’s launch of the Bridgeport High School Suicide Prevention Club, now called Life League, the group has now partnered with the United Summit Center to further support teens and their mission to improve mental health. In June, a support group was created to offer a place for teens to share their concerns, experiences, and ideas regarding mental health and wellness. The group is called VENT and allows a safe, anonymous environment in which teens can learn self-care strategies, how to set boundaries, how to help others during a mental health crisis, and how to seek help and refer those in need. 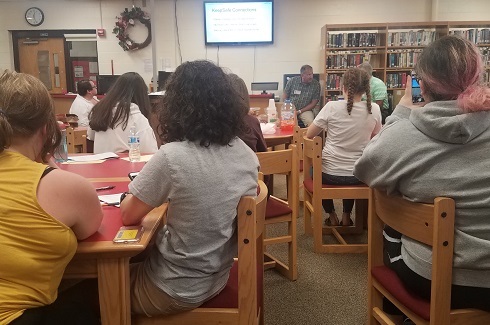 United Summit Center Crisis Unit Coordinator Tim Craig has been instrumental in helping to educate both teachers and students at BHS in regards to mental health and suicide prevention. His involvement in Life League helped lead the group to develop VENT, which will be coordinated by Crisis Case Manager Marissa Shanholtz. Shanholtz and Craig both work with the Children’s Mobile Crisis Unit, which offers in-school services, crisis stabilization services, case management, outpatient counseling and prevention assistance to area counties. Misty Childers, Unit Coordinator for the Children’s Crisis Stabilization Unit, approved the partnership between the United Summit Center and Bridgeport High School’s Life League program, adding a focus on community education and further destigmatizing the necessary conversations needed in this area. During the VENT meetings, students are encouraged to explore various subjects and themes that can affect mental wellness. Each student will have the opportunity to share concerns, make suggestions on applicable strategies, and interact with a mental health professional if he or she wishes. “Dealing with mental illness can be very isolating and we hope that by coming together, the group can help individuals with recovery and self-care,” said Shanholtz. As a Harrison County graduate, Shanholtz has seen first-hand how students struggle with mental health issues such as depression and anxiety. The VENT group is free and open to anyone in middle or high school. Meetings are held at the Bridgeport location of United Summit Center on the fourth floor of the Mountaineer Medical Building next to United Hospital Center at 120 Medical Park Drive in Bridgeport. The next meeting will be Wednesday, July 11, from 4:00p.m. to 5:30p.m. Those who are dealing with personal mental health issues or those affecting their friends and family are welcome to participate and all discussions will remain confidential. While VENT students are in their group meeting, parents and adults who are interested in discussing mental health and addiction topics will meet in a separate space in the United Summit Center’s Bridgeport location. For more information regarding VENT or the adult group, please contact Chris Mullett at cpmullett@gmail.com.